They are married for more than two years; but they never went for honeymoon. Instead of having a costly marriage ceremony and honeymoon, they decided to spend both their money and time to make a difference, through some random acts of kindness. 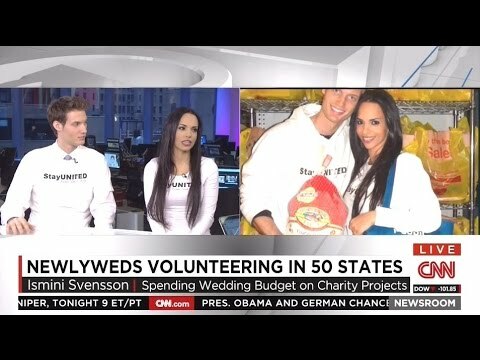 The New York couple Mark and Ismini Svensson are determined to spread kindness by doing ‘50 Acts of Giving Back’, rather than relaxing in post-wedding bliss. Their mission is to complete random acts of kindness in every U.S. state; from giving out meals to homeless people in Missouri and showing love to rescue animals in Florida, to donating gifts to sick kids in Arkansas and supporting domestic abuse victims in Utah. We both realized that what makes us happiest is helping people in need, Said Miami. Mark and Ismini Svensson started a New York based nonprofit Stay United, with the help of donations and support they come across while travelling. The nonprofit focuses on the issues like education and health for youths. The message is, everyone can do something to make a difference — even if it’s small in their communities, even if it’s just a positive compliment to someone. You never know the impact it can have on another person. Said Mark. Through social media, the couple has engaged groups and people from each state to see where and how they could help along the way. Though this wonderful journey of spreading kindness would come to an end very soon, but they are determined to keep the giving going. On the Stay United website, they are encouraging supporters to conduct their own random acts of kindness and share it with the nonprofit on social media, so that the good deeds live on.